"Tender full-flavored pork chops that are always a crowd pleaser. Great on the grill! Pat dry the meat before you put it on the grill for good grill marks. Also, use a meat thermometer to insure proper cooking." Whisk the beer, wine vinegar, corn syrup, mustard, garlic, sage, salt, and black pepper together in a bowl; pour into a resealable plastic bag. Add the onion and pork chops, coat with the marinade, squeeze out excess air, and seal the bag. Marinate in the refrigerator for 12 hours. Remove the pork chops and onions from the marinade and set aside on a platter. Drain the marinade through a fine-mesh strainer, discarding the strained liquid. Spread the garlic mixture caught in the strainer over the pork chops. Wrap the onions in aluminum foil. Cook the packet of onions and the pork chops on the preheated grill until the pork is no longer pink in the center, about 7 minutes per side. An instant-read thermometer inserted into the center should read 145 degrees F (63 degrees C). 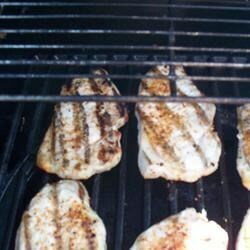 Great grilled chops full of flavor! This recipe was just ok for my family. They didn't like the overall flavor and frankly, prefer our regular chops. These are just great! Don't normally use corn syrup in a brine, but it imparted a bright, smoky note! Perfect grill food. Thanks for the recipe. My husband and I run a bar/grill and have served these chops for a lunch special - the customers LOVED the flavor. We served them with mashed potatoes and gravy. I was hopeful that this recipe would make pork chops tastey for my husband who doesn't like them. But Nope. He did not like the taste of the marinade and ours were not very tender. Awesome recipe! These pork chops come out moist and flavorful!